The arrival of fall in Oregon offers the opportunity to celebrate Thanksgiving weekend in Oregon wine regions. Unique among domestic wine regions, Oregon wineries, large and small, open their doors for three days of wine tasting with appropriate food pairings, winery tours, winery dinners, live music, and best of all, discounts on wine buys. Many wineries are offering barrel tasting of the 2016 Pinot Noir vintage, tasting of the highly acclaimed 2014 Pinot Noir vintage, and tastes of library and limited release wines. For a complete listing of winery open house events, consult the latest print version of Oregon Wine Press, or visit the newspaper’s website at www.oregonwinepress.com/thanksgiving-in-oregon-wine-country-2016. The photo below is of Luminous Hills Vineyard this autumn. 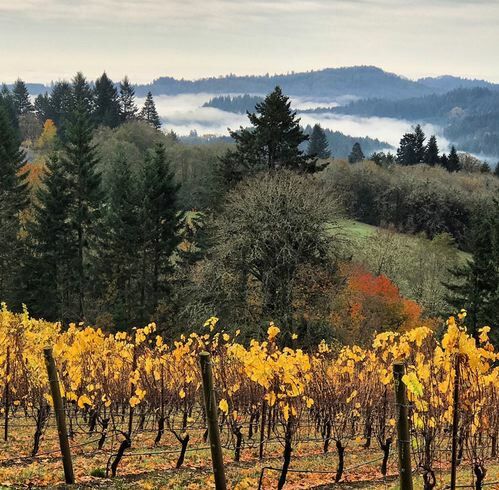 If you are planning to visit Oregon’s Willamette Valley for Thanksgiving weekend, November 25-27, there are several other sources of information. 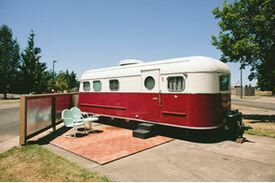 Visit www.travelportland.com for a comprehensive listing of Portland’s wine, beer, artisan food scene, as well as lodging options. Portland’s urban wineries are particularly noteworthy, and one could spend the entire Thanksgiving weekend visiting superb producers without leaving the city. To experience Portland’s wine scene, PDX Urban Wineries at www.pdxurbanwineries.com offers a passport through nine local tasting rooms. Among the twelve winery members of PDX Urban Winery Association are notable Pinot Noir producers Boedecker Cellars and Willful Wine Company. Willamette Valley Wineries at www.willamettewines.com/event/wine-country-thanksgiving/ offers a printable Guide to Wine Country Thanksgiving. The 35 wineries in Tualatin Valley, located in the northern tip of the Willamette Valley, is just minutes driving time south of downtown Portland. Visit www.tualatinvalley.org/ wineries-vineyards/annual-wine-events/thanksgiving/thanksgiving-wine-weekend-2/ for wine touring information Thanksgiving weekend. Two lesser known Oregon regions that would interest wine enthusiasts are Mt. Hood Territory and the Columbia Gorge. The Mt. Hood Territory, located southeast of Portland and easily accessible by a short drive, is best known for its outdoor activities, but The Territory is blessed with passionate vintners, sustainable farmers and all-star chefs. Visit www.MtHoodTerritory.com. The Columbia Gorge Wine Country north of Mt Hood Territory and 60 miles east of Portland has 50+ vineyards and 30+ wineries among the wild beauty of the Columbia Gorge scenic area in both Oregon and Washington. The diverse topography of the region is highly suitable for world class wine production of diverse grape varietals including Pinot Noir. Visit www.columbiagorgewine.com for a wine touring map and visitor’s guide. This issue may be late for many readers to contemplate a visit to Oregon wine country, but remember that Oregon wineries also have a special Memorial Day weekend each year. Many winery tasting rooms are open year round and most others are open by appointment. 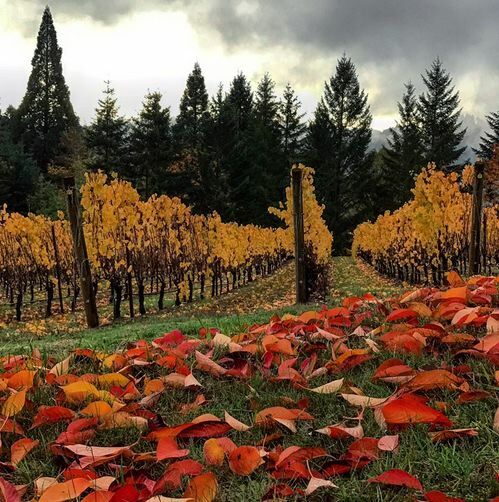 The winter months can be rainy in the Willamette Valley, but the region is uncrowded from November to April, and the wineries are quiet and welcoming to visitors who can experience an unhurried visit. The websites listed here are valuable resources for travelers all year. 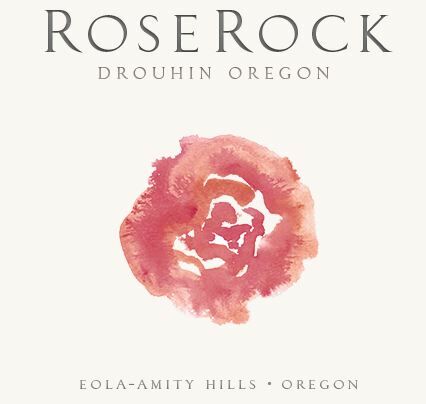 Oregon has enjoyed an unprecedented string of three warm vintages: 2014, 2015 and 2016. The 2016 vintage had an extremely early bud break beginning about April 1, and a very early harvest, among the earliest on record. Many wineries reported that their harvest began in late August and had concluded by late September. The combination of early bud break and early harvest still led to adequate hang time, and the early onset of harvest allowed growers to pick fruit without winter weather pressure. What has the last three warm vintages in Oregon meant for the character of Oregon Pinot Noir? Consumers will find the wines generally more akin to California Pinot Noir, with higher alcohols, more structure, more concentration, and darker fruit aromas and flavors. However, the heat during September and early October allowed vintners a wide latitude regarding picking decisions and resulting styles. Many of the Pinot Noir wines reviewed in this issue came from the 2014 vintage. 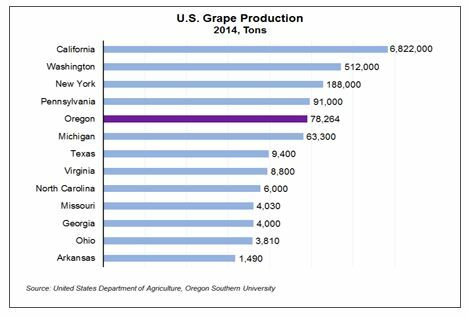 The Oregon Wine Board’s annual Oregon Vineyard and Winery Census Report indicated that overall wine grape production increased by 39 percent in 2014, to 78,000 tons, with the majority of the increase coming from higher yields. Vintage 2014 was the third year in a row that Oregon’s wine industry had reported double-digit gains in production. The Report found that Pinot Noir is still by far the most popular Oregon grape, with 17,146 acres or 63 percent of the total acreage (compared to 14,808 acres or 62 percent of total acreage in 2013). 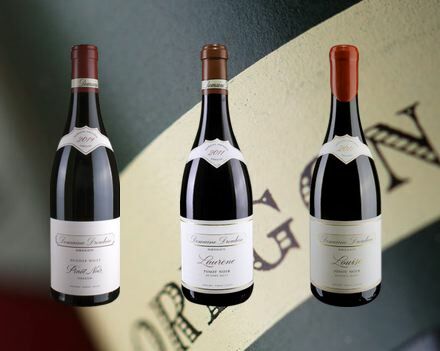 Remember that the late André Tchelistcheff, one of California's greatest winemakers and consultants, once said that when "the great Pinot Noir is made, it will be made in Oregon." Three generations have been stewards of the family owned Dion Vineyard. Kevin Dion Johnson and Beth Klingner are currently in charge. The vineyard consists of 60 acres of southerly slopes rooted in Laurelwood soils at elevations of 300 to 500 feet. 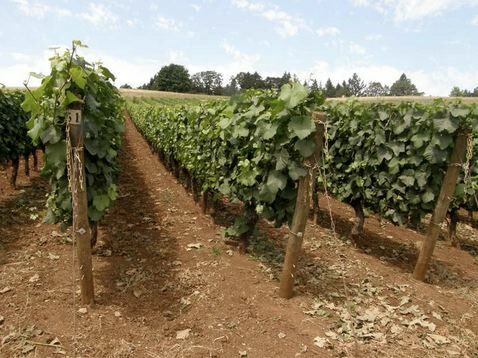 The Laurelwood soils tend to reflect the higher tones of red fruits (pomegranate, red cherry and strawberry) more so than other Willamette Valley areas. Also, the vintners at DION Vineyard tend to pick on the front end of ripeness resulting in lower alcohols, pleasing acidity and more elegance. Pinot Noir, Pinot Gris and Chardonnay are primarily grown here. Some vines are over 30 years old. The winery website is www.dionvineyards.com. I have enjoyed reviewing many wines from this outstanding Yamhill County Pinot Noir producer. The wines come exclusively from the 20.9-acre estate vineyard that is ideally situated with a steep south-facing slope at a perfect elevation as well as poor soils. 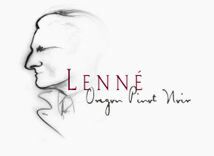 The 2014 vintage Lenné Estate Pinot Noirs are bigger styled, powerful and fruit forward wines with notable tannin. They currently are somewhat shy, simple and lack some aromatic charm, so it would be advisable to cellar these wines a couple of years. Owner and winemaker Steve Lutz considers 2014 “a remarkable vintage.” He feels the vintage is similar to 2008 in many ways and predicts the wines will be long lived. If you must pop the cork now, decant and serve with some protein like steak or cheese to counter the big fruit tannins. Steve considers the age ability to be 6-10+ years after release for all but the Le Nez wine that is meant for earlier consumption. I have given a range of scores for the wines because they were difficult for me to accurately predict their future based on their current reluctant attitude. Damn Pinot Noir is quite the vexing mistress. The wines are available on the winery’s website at www.leneeestate.com. VIDON Vineyard is located in the Chehalem Mountains AVA at an elevation of 300 to 500 feet. The site is southwest facing, very warm, and contains deep volcanic Jory soil. The three blocks of Dijon clone 777 and 115, and Pommard, were planted in 2000 and 2001 with a vine density of 1,555 per acre. The wines represent the 12th vintage for farmer and winemaker Don Hagge. The grapes are de-stemmed into 1.5-ton fermentation tanks. A 3 to 5-day cold soak is followed by spontaneous fermentation with feral yeasts. The cap is punched down by hand. The wines are in the winery’s barrel room where they undergo malolactic fermentation. The wines are estate grown, produced and bottled. The winery website is www.vidonvineyard.com. 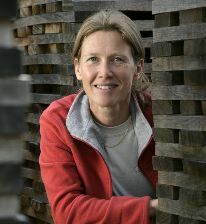 Owner and winemaker Pam Walden crafts Pinot Noir at an urban winery in Portland. She enjoys working with Pommard clone for its elegance and texture, especially in a warm vintage like 2014 when it tends to ripen later and retain more grip than other clones. The wines reviewed here represent outstanding value. 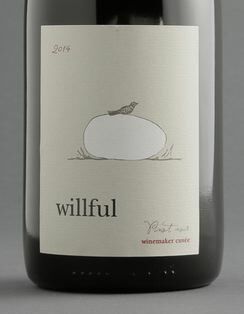 Visit the winery website at www.willfulwine.com.